Hiring a personal trainer can be a major investment. The average cost for one is $50 per hour, according to WebMD, and oftentimes they are much more expensive than that. But if you're a fitness lover looking for an optimized workout with specific instructions, don't fret — you have plenty of cheaper options. Thankfully, it's 2018 and shelling out cash to meet one-on-one with a certified personal trainer isn't always necessary when you're equipped with a smartphone. When you're ready to create a personalized fitness plan, you're going to want to use an app (or many apps!) to focus your workouts, track your successes, and plan your goals. What is A 7 Minute Workout Challenge? If you’re looking for a fitness app for your iDevice that’s going to give you a hand in achieving your weight and body goals, we recommend you check out A 7 Minute Workout Challenge. 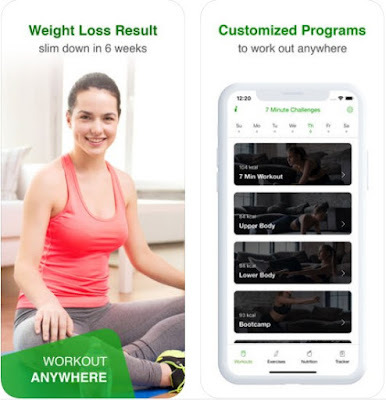 This is one of the fastest and most effective iOS apps designed for users that want to slim down in 6 weeks, providing with customized exercises that can be done anywhere and anytime. Read further to find out more about our choice. A 7 Minute Workout Challenge is an efficient and simple weight loss app that features powerful workout programs designed in a fully customizable way. This means that each user can coordinate and select their preferences and receive a full workout plan created for their body. With this amazing app, you can exercise anywhere and slim down in only 6 weeks. Choose from different workout challenges, let video instructions guide you, get nutritious and tasty meal recipes, track your activity and weight with the calendar, and a lot more. These are the exercise challenges you can choose from: Full Body, Upper Body, Lower Body, Bootcamp, Belly Burn, Fat Burn, Calorie Burn, and Aerobics. Feel free to say goodbye to expensive equipment, forget about going to the gym and throw away any fat burner pills. Exercise and achieve your body goals by giving only 7 minutes of your day, get A 7 Minute Workout Challenge for free from the App Store’s link below and don’t forget to show it to your friends!